and Canning Jars. . .
with flowers and petals. . .
my Hatherley Lattistep is standing in for service! collected over the years. . .
a song~ now have blooming roses instead. In celebration of canning season and the 100-year anniversary of the first true Perfect Mason pint jar, I’m sharing some Ball Jar Love and giving away 2 sets of 6 Ball Heritage Collection Mason Jars, tinted with antique blue with the Ball logo embossed on front and the 100-year anniversary dates embossed on back. reliability for your home canning needs. . . The winners will be chosen June 14th! I just started following your blog and I absolutely love it! So many gorgeous pictures I have gotten so many ideas from you! Love everything that you write about. I love mason jars especially the blue ones. I think I would use some for decorating and I want to learn how to can fruits so I think I would use some for that too! Thank you for a chance to win and for your inspiration! I do follow your blog for I am a lover of beautiful flower arrangements. I would fill the blue ball jars with tomatoes with basil and garlic. I always need new jars for canning, storage, or flower bouquets. I love to make candy, and cookies, and package them in Ball Jars. I follow your blog via e-mail. I love these blue canning jars and would use them – filled with flowers – as a centerpiece for the table. Thank you for the opportunity! I love the whole gorgeous thing, from the fabulous watering cans to the jars and back again. (Now you have me wanting to decoupage a watering can. ) I’m not a canner, but I love to use the jars in decorating..
Do you have a little pack of elves who come in and help you do all this fabulous decorating? You have more energy than my cocker spaniel. Great ideas and photos. Thanks Mary. The blue jars perfect for filling with some sand and shells from vacation or for the 4th of July fill with red and white flowers. Lastly fill with home made salsa from the tomatoes from your garden, put in a pretty basket along with chips and a red, white and blue pin wheel and give to a friend just to celebrate your friendship. I have a vintage watering can collection also, along with vintage garden implements and seed packets. Guess you can tell I am a gardener! Keep up the great blog, Judy R.
Oh Mary, what a gorgeous post. I love the blue ball canning jars. I’ve been dreaming of having some for so long. I love the look of pink flowers in the blue jars. I also love putting some sand with shells in the jars with a small candle. I would absolutely LOVE to win these jars. I just LOVE them! I’ve been following your blog all winter – love it! But the best part is, I’ve convinced DH that I need a potting shed like yours! It’s being built now. I can’t wait – so many uses, and I’ve been collecting for thirty years so I have lots to fill it up! I’ve planted five variety of tomato plants so I could sure use those giveaway jars. Beautiful post, Mary. I’ve been waiting for a new one involving your lovely potting shed, as I adore seeing it. I buy my dry herbs and spices in bulk. I then store them in blue canning jars and use vintage labels on them. They look so great on the shelf in the pantry. If I won, I would put these jars to work on my pantry spice shelf as well. I’m a canner, but I couldn’t bear to use these beautiful blue Ball jars for that purpose! I’d have to use them for display purposes or pluck some flowers into them. I’d love a chance to win some of them. Thanks for the opportunity and I follow by email and on FB. I would use these jars for flowers and decoration around my house. I live in a house built in 1890 and these would be lovely! I would use my new / old mason jars as drinking glasses. Perhaps filled with lemonade or tea or my favorite – rum and diet coke! Thanks for sharing your blog I really look forward to the posts. We have in common liking watering cans though my collection is mostly small ones that I can use on the table. As for blue jars, you’ve seen enough of my tables to perhaps remember that I use jars and bottles again and again as groupings for flowers or to hold napkins or flatware. It’s not likely they would be used for canning! You are kind, Mary, to offer your many readers something special, bu then you do that post after post! love your blog…would fill the jars with flowers and hang with twine to hang around my mom’s doorknob! She would open her door to a happy surprise. thanks for the inspiration. Wow! I would line the window sill in my breakfast foom with cool plantings and rootings. And then my table on my front porch that has the table with the glass top and the old sewing machine base wuld look wonderful with a couple on it with flowers in them. Oh, once again what a beautiful post! First, I would use some of the jars for decorating! I’ve always wanted some of the blue ones, and would give a few to my granddaughter who is marrying in June…(how ironic she is using the blue canning jars as part of her theme!) and my honey will make some rhubarb freezer jam for me! Second, I do follow you by email and love it..that way I never miss even one of your posts! So….please add me to your drawing! Mary, I happily follow your blog and have been especially excited to find several posts of late. Truly, you inspire me! And, I appreciate the calmness that your writing resonates. Nice! A blue Ball jar sits on my kitchen table filled with flowers – always. It’s a *happy*. I enjoy filling jars (olive, pickle, mayo, etc) with pretty flowers and passing them along to friends. I would love the opportunity to share some anniversary jars with others – filled with smiles from nature. :-). Thanks for the post and giveaway — have a lovely day. Hi Mary, wow…how would I use them….let me count the ways…OK too many to count. LOL Vases, decoration, to can tomato sauce, hold silverware for outdoor BBQ’s….like I said, too many too list. I love the blue color of the canning jars. I would actually can some fruit – strawberries, peaches, etc. so I can enjoy them in the winter time. I definitely would use them for canning – spaghetti sauce and salsa! I can’t wait to eat it as I make it! I can’t recall how long I’ve been a subscriber to your blog, but probably about 6 months! Your photos and tablescapes are always so inspiring! I would use the mason jars to hold flowers for an uncoming Alice in Wonderland baby shower. Thank you for bringing a little something beautiful to my day! I would give my sister 3 of the jars to put in her kitchen and flower shed. Then with one of the jars I would put some very old pearl buttons that belonged to my grandmother from when she worked at the old Pearl Button Factory here in Iowa. Then would save on to put summer flowers in on my table. Love your blog, it takes me places I wouldn’t otherwise get a chance to see. Absolutely love everything! The canning jars and watering cans are the perfect way to say summer! I follow your blog via e-mail. I adore everything you do! Since these jars are anniversary jars, I would probably display them in my kitchen glass front cabinet, and occasionally take them out to use as flower vases for cuttings from my garden. Thank you so much for the fun chance to win! Beautiful pics and watering cans! We are a canning family, but spead across the country. We trade off Mississippi backberry jams for Florida marmalades for Carolina peaches at Christmas time. The jars are recycled, and it is always fun to receive a truly vintage blue jar. I would love to use the anniversary jars to start passing to the next generation of canners in my family. Happy Weekend! What a gorgeous display, Mary! The floral printed watering can is really different & special. I have exactly ONE galvanized can & used it in my last post. I didn’t know that Ball had made these commemorative jars…what wonderful keepsakes they would be. I’d fill them with PINK PEONIES, as I love that color combination. Thanks for sharing your wonderful collection of garden *stuff*, so beautifully displayed. p.s. I’m a follower from waaaay back & I do get your posts via email, which are always a pleasure to open. I love your blog and enjoy all your creative ideas. We are starting this weekend to build our potting shed! I also can fruits and veggies, I would love the blue mason jars! :D Your collection of watering cans is fantastic! I love it when you play in your potting shed and share your photos with us. I would love to have one, too! You are truly amazing and terribly generous to share your ideas! I, too, have used many of your ideas and my guests and family think I am so creative!! I usually fess up, though,and give the credit where it belongs. 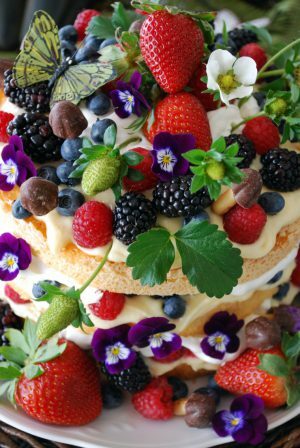 I love the jars and can see making individual trifle for July 4 th…blueberries, raspberries …how cute! I love the idea of hydrangea nestled in and used around the lake cottage! Loved your post. What a fun collection you have of watering cans. I love people who collect different things . It is just fun. Love all your watering cans. A beautiful collection. The flowers are so bright and colorful. If I won, I would use the jars for displaying flowers. I subscribe to your e-mails and I follow on Facebook. Flowers and more flowers. Years ago I gave food in a jar gifts to teachers from my father in law’s stash that is long gone. Sometimes I wish I could just move in to the places you post Sigh, Have a great day. Gosh Mary, you’ve outdone yourself once again. This is gorgeous. The photos are lively & rich, with so much to see. As I am not on Facebook I follow you by email. I would LOVE to win those so very cool blue jars to use for summer salads & to hold fresh flowers!. You are the one who got me to fall in love with Mason jars in the first place! You continually amaze me! With each new post, you make me smile, relax and greet my days with a feeling of fulfillment. Your staging. Your photography. Your ideas. Your words. Like reading a brand new juicy novel with each entry! And today? Well….I collect watering cans AND my love of antique blue tinted mason jars abound in my lakehouse! So many days I feel like you and I share a brain and a heart….would so love to visit with you and swap stories. I think there would be many! But alas, I’m in the Deep South far far away. So I’ll just keep on anxiously awaiting each new thought and each new image you provide for us. Thanks Mary….you’re a gem! Every time I visit your blog, I feel like I’ve been looking through a favorite magazine. I feel like I’ve said this a million times, but you are SO talented. Your beautiful vignettes, your table creations, your photography style is all so amazing. I just love the wonderful ideas I get from your posts. Those pretty blue Ball jars are wonderful. I can tell you for sure I would use them for flower arrangements; I’ve been putting fresh flowers in canning jars since we were first married — love the look! I’d also like to serve iced tea in them for a summer get together; I think that looks so pretty and refreshing. I’d love to be considered for your giveaway!! I follow you via e-mail and Facebook, and I have you on my blog sidebar, as well. Thanks Mary and have a wonderful week!! 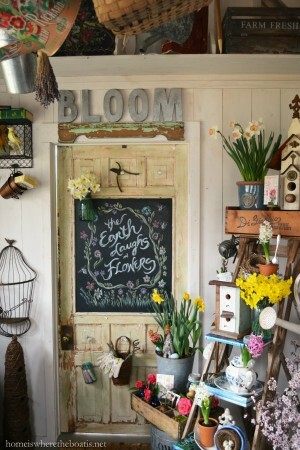 I enjoy reading your blog and I love your potting shed. I have a garden shed and have gotten a lot of ideas to decorate mine from seeing how you did yours. I also love mason jars of any kind. I would use them to hold flowers, store and display small items and also use them to serve summer drinks. Would love to win the jars and also the give away is on my son’s Birthday. They would have a special meaning. Thank you for the giveaway Mary! I would use these to make some dessert-in-a-jar gifts to take to some of the widows at our church. I’ve been looking for something sweet to put the desserts in and this would be perfect! Love your shed and flowers. Love your blog, my friend Teri introduced me to it and I love, love, love it! I would use the Ball jars for the dessert idea, it was so cute. Also, I would use them to decorate for 4th of July! and finally I would use them to get going with my canning for the summer. Love the frog in the bottom of the watering can, so cute !! Gosh I wish I had a garden shed, hmmmm…dreaming. I love the anniversary mason blue jars, and have been searching for them!!! I would love to fill them up with treats for my sisters in memory of our mom, whom loved to “can” for our family !! p.s. did you have to order the anniversary jars?? I love to fill jars and give them as gifts and make desserts for my family. Also I decorate with jars around my house…filled with flowers, shells and candles. I start my morning with your blog…’fills my heart and mind with the loveliness of flowers and photos….I love glass….and love to put flowers in everything! Hi Mary, First I am a subscriber and love opening my inbox each day for your post! If I won these, I would mainly use them for flowers but also since I can, I might put Spiced Peaches in one jar and Palisades Peaches in another. I have always love the blue Mason jars but haven’t found them locally. Wow! So many beautiful flowers this time of year…I’d be filling the jars with them. Thanks for the give away. P. S. I follow your blog via email and look forward to each and every one. They’re filled with such beautiful, inspiring ideas. I follow by email, Facebook, and if I lived any closer you’d have to take out a restraining order on me because I’d more than likely follow YOU around as well, but I digress… ;-) As much as I am enjoying canning these days, these jars are far too pretty to hide away in a closet. Filled with white flowers they would look very pretty running down the center of my table and paired with my Nikko Tea Rose dishes. Love your potting shed and I would love to win the Ball jars to display my peonies and my sunflowers this summer. Thanks for this great giveaway. P.S. Following you on email!! I think I’d use those beautiful jars as drinking glasses for lemonade. Love your blog and your beautiful photos! Thanks for the opportunity to win the blue Ball jars. I use jars for decorating around the house — flowers, sea shells, candles, candies, etc. The options are endless! I follow you by email and enjoy your posts very much. I would use the mason jars for both flowers and pickled peaches, which is an overnight recipe that does not have to be sealed. Thanks for the opportunity. Love your blog. You are so talented and create such interesting, well thought out displays. I also have a sweet Bichon named Gracie! I would love to win the Mason jars and would use them as food storage, vases and with seasonal displays. Thanks for sharing the happy! i could not love this anymore, and i am the garden girl, you are shaming me with all your funness on a ladder! it makes me go crazy inside wanting my own greenhouse here, but mine is always full of dirt and hard working, i want a pretty place like you! again twins, i have he same jars, got them a month ago for sea dream, couldn’t look cutter with your hot pink and string, so jealous of all the fun you have ahead of me! I like the idea of using them for our second home as a storage for flour, sugar, or other things that need airtight storage. I also love the idea of using the for favors..drink glasses, napkin and silverware holders for a holiday decorated table..cookie mix jar for giveaway..and flowers, flowers flowers. They are an incredible item with sooo many uses..I would love to WIN! I love mason jars and have been collecting them for years. I use them for flowers.buttons,food and so many other things. It’s a great giveaway. I have been a subscriber for a while now and love your blog! Let me just say, “I am obsessed with blue ball jars!” I can just see one on my table filled with white daisies! Thanks for the giveaway! I would use my blue Ball jars to serve good ole summertime fixins & thanks for always inspiring! I would love to win the blue canning jars. I would use them to store my grandmother’s pear relish that i make every year for tfamily and friends. Of course, I would have to keep one for storing bath salts too. For my kids to drink out of and for them to take soup to school! Completely adorable!! Oh! I so want these! Have a collection of the vintage ones that hold wooden thread spools, buttons, floral arranging wire, marbles, change from the pockets on laundry day…just everything! Lately i have been putting photos inside them for display. I want these to us for drinking glasses & of course canning! My lemon curd & mock Devonshire cream fit them perfectly. Hey Mary; I Love your Blog!! I am a Happy Subscriber :-) Your photos are Stunning!! I make homemade Pickles, but these jars are much to Beautiful for my Pickles!!! I would use the jars to hold special things and for vases if I am lucky enough to win! Thank-You for the chance! I love these jar and have them on my wish list! I would use for flowers and iced tea and maybe an ocasional salad. Love your potting shed and would be quite content to live there! I love, love, love the blue jars!! I enjoy your blog very much and have tried some of your receipes. I would use the jars for flower arrangements throughout my house. How fun! Great photos, as usual! I follow your blog by email and on Facebook. You do beautiful work! oh ,I would use, use ,use , and share them –2 daughters and daughter in law and I would share for flowers ,buttons ,charms thread ,beads and many things I like to have out to see. In blue jars they would be even prettier. I follow you by e-mail and look forward to each new table setting and your wonderful potting shed. I don’t know what I would do with the jars yet. I use them for everything: canning, to store food, leftovers, seeds, left over ground coffee or just beans and teas, homemade oils, alcoholic bevs, to make flour bases for gravy, flower vases and on and on…HOWEVER, with the type of jars they are (special), I’m unsure as to what I would do. By the way, love your blog–pictures, advice, recipes etc. You should know that you are appreciated. HELLO! WHAT A BEAUTIFUL POST! I’D USE THEM TO DECORATE ALL ABOUT THE HOUSE,AS VASES FOR BOOKENDS, FOR DRIED FLOWERS IN A WINDOW LEDGE, MAYBE EVEN FOR STORING CANDIES! THANKS FOR SHARING! HAPPY TO FOLLOW YOU>BLOG LOVIN’! Perfect giveaway, the jars have so many possibilities. I was just looking for jars to use in my craft room for some colored pencils or they would make great vases for summer flowers. Thanks so much. I would use most of them for fig preserves from my fig tree. I love the blue canning jars so I would probably use a few for flowers and decorating. Would love the blue canning jars for casual flower arrangements–think sunflowers mixed with wild flowers. Great to store small collectibles, to serve those layered desserts and salads, or just to put in a sunny window for color. I’m back with my second comment for a try at winning the Ball jars. :) I think I forgot to mention in my first comment that I LOVE all your watering cans, especially the flowered one and the Anthropologie can with the little froggy in the bottom. All your flowers are lovely, especially the big pink Peonies(?). Your stamped spoon in the last shot is perfect — love the “Keep Calm…” slogan. Lovely! Your pics make me smile! :) If I won, I’d be smiling, but I’d use them to make sweet vases,wired to hang on our porch! And save some to hold my lovely roses all Summer! Oh, and save two for us to sip our limeade from while we watch the sun set and count our blessings! Thanks for the chance! Ooops! I forgot to say I follow you on Bloglovin, Facebook,Pinterest and email! Thanks for everything! You have destressed ( is that a real word ) once again. I love the watering cans and ball jars. As to how I would use those wonderful anniversary ball jars, we do a lot of canning with produce from our organic ” farmette” and at Christmas family members get a basket full of the year’s bounty, so I would sprinkle the jars among the baskets. I would probably be partial to the recipients that I know have a love of fresh flowers. That would give those jars a blessed double life! Thanks for the generous give away! Mary, it’s always fun to see what you’ve done in the potting shed. You collection of watering cans is stellar. I’ve a few of the vintage Ball jars that I use to put summer flowers in. If I won the new ones, I’d add them to the mix. I recently found a metal carrier that they will fit in. Yipee! Love this soft aqua for summer. Hello Mary…Happy Weekend! Beautiful giveaway!!! I haven’t tried floating petals or flowers in Ball jars but I will certainly try that sometime soon, I am lucky enough to have moved into a new (old) cottage and (bonus) it has a beautiful potting shed. I am hosting a breakfast the day after my son’s wedding this September. I can just picture those beautiful Ball jars decorating my potting shed which is just outside my garden. Oh they would just be perfect!!! Thanks for helping me picture that and thank you for your blog! I would use the blue Ball jars as centerpieces filled with zinnias. I’m a subscriber/follower too. I really have no idea how I would use them but they are beautiful and I hope that I win. Love the ball canning jars. I would use them for flowers at my nieces baby shower. I would use them for drinks! Sweet tea to Long Island ice tea! I am a florist & gardener ILove all your ideas have had an old ladder for a couple yrs.now I know how to use it. I love antiques & decorate with them. The blue jars are very popular for wedding centerpieces that is how I would use them the real old ones are often hard to find. Would love to win but incase I don’t can I buy them somewhere?? Thanks for the inspiration. Thanks for another inspiring beautifully put together posting. Being a southern girl, I would fill the mason jars with real iced tea and serve to my family and friends with some tasty homemade treats as we enjoy good conversation, friendship, and wonderful lazy summer evenings on our porch. Mary,You always make me smile to see what creative ideas you have come up with,always so beautiful!!!! Those blue jars I can see holding my strawberry shortcake,cornbread salad,iced tea,I can go on and on.I would love to have a set of these jars,I have an old timey kitchen hoosier cabinet that they would look great displayed in when not being used in a creation for the day.Take care and make sure to keep doggie treats in one of them for your babies!!!!! Mexican soup is what I would fill those beauties with. Have a great weekend. Love your blog Mary. I’ve recently painted the inside of our garden shed and love it even more since I’m in it so much most of the year. I have a few old blue jars that hold buttons, but would use these for drinks, flowers, holding silverware for parties, shells, and probably candles. I currently have 3 cases of clear ones for canning tomatoes – a yearly event my mother and I do each fall. She will be 86 this Oct. and has already mentioned that she is looking forward to canning again this year. Canned tomatoes are the best! Thanks for the opportunity to possibly win. Your blog is a real inspiration. I follow you my e-mail. There are so many things you can do with canning jars. I like using them for candy jars, vases, summer drinking glasses, and canning pickles, sweet and spicy relishes, rhubarb, peppers, tomatoes, and soup. I just love the vintage blue! I most definitely follow and a subscriber. Hi Mary, I enjoy reading your blog and getting ideas from you; I LOVE your photography!! I would love to win some canning jars as I want to teach my granddaughters who just moved next door how to can this summer. I grew up next door to my grandparents and now my grandddaughters will grow up next to theirs. My grandmother taught me how to can, sew, garden, and make bread. I’m hoping to continue the tradition! Thanks!!! I would use these lovely blue jars to decorate my dining room table for the fourth of July. I’ve been planning in my head and needed something new to pop the color! I also love your photography and hesitate starting my own blog until I learn how to take such beautiful pictures. That also means I would have to learn to arrange things as beautifully as you do. Enough flattery. Please send me those jars! I was thinking of using the jars as a vase for centerpieces at a bridal shower. The dated 2013 would be a great keepsake for a year that started with a proposal and is ending with a wedding! I would use the jars for beautiful flowers. I really enjoy your great decorating idease and photography! I am new canner, actually taking a class on it this morning. I also like using canning jars to decorate and for storage. They are so versatile! I have several old blue jars but didn’t realize they were making new ones. Gorgeous photos as always! I love these 100 year Anniversary jars and would use some to hold flowers and others as tea lights! Soooo pretty! Thanks for the chance to win some! I follow you on Bloglovin and also on FB!! Wonderful post. I’m catching up on my Bloglovin and really would like to put those Ball jars to use … flowers, maybe some canning, they’d look lovely filled with flowers on my balcony. YeeHaw! Thanks for the chance. Mary, as soon as I saw that your watering can had blooming roses I had to leave a comment…you are a girl after my own heart! The jars are wonderful and perfect for flowers and also for picnics filled with delicious recipes found on both your and Jain’s beautiful blogs. Mary, your eye for beauty in the everyday is amazing! So often we look at the things that surround us and don’t even notice what an beautiful world we live in. I would love to have such beautiful jars to can my abundant summer produce. They remind me so much of my beloved grandfather who used to “put up” the bounty from his garden (along with making homemade root beer; what a laugh we kids would have when one of those jars exploded!). Your watering can collection is impressive and your flowers so lovely. I only have two cans and enjoy them so much. I would use the Ball jars I am sure for flowers. I am loving your blackberry blossoms and your peonies are divine. I am so jealous you can grow peonies. I follow by email and eagerly await each of your posts. Great giveaway. You are generous. Mary,I just recently started following your blog. I love the way you fill your ladder to the brim that’s the way I have mine. I think I would use the jars for lanterns on my porch fill them with sand and an tealight I think the glow would be so pretty. I would love to win your giveaway. I would use them to display flowers for table centerpieces on July 4th. Love the anniversary canning jars. I would add a pump lid to a couple of them for handwash soap. I would use the remainder to decorate a Hoosier cabinet we recently acquired. Thank you and have a great weekend !! Hi Mary, I love visiting my favorite potting shed. You have quite the collection of watering cans. If I won the pretty canning jars, I would use some for canning jam, some for drinking iced tea and of course, some for pretty flowers, and some for making individual salads or some other foodie creation. I forgot to me to mention that I follow you by email. Thank you for the opportunity to win! What a great post. I love the jars and everything else. I’m following & love it. I’d use them for entertaining! will love it!I would make solar lights out of the mason jars! I would use them on my patio with small candles in them to give it a nice glow in the evening.. I might even use a few to show off my old buttons….. so many ways to use them…… I follow you on both FB and blog which I love….. I am a subscriber to your blog by e-mail and love, love it. When I discovered it, I read many of your older blogs. I would use those Ball jars for canning some pear honey and pear jubilee. I’d use them to store easy snacks! Ten days ago we had a 5.7 earthquake and I lost 2 of my 3 aqua blue canning jars. I brought them from my aunt’s house after she passed away, so I am guessing they were probably from the 30’s. I kept the glass shards for a couple of days and then finally put them out in the trash. I used them often to display seasonal wrapped candies, or several of my peonies when they bloom. If I were lucky enough to be able to replace them, I would definitely display them in a safer location! However, I would continue to use and enjoy them. I love visiting this sight, and find your decorating my style, too. So many thoughts on how to use the jars. I so wish I had a potting shed! Yours is amazing. Your collection of watering cans is enviable! Perhaps even jealousy producing! I need to those Ball jars – I would put my solar ball jar lids on them and highlight the edges of my back porch! Pick me! Pick me! I’ve been eyeing these at stores, contemplating what I would do with them. I decided I would keep two for myself, and share the others with my two daughters. I’d fill mine with home made salsa, or maybe just some lovely flowers! I would cherish them no matter what I decide! I would use these beautiful jars to put flowers in and to hold my sewing/craft supplies in my sewing room! Hi, I am Wendy’s friend Teri. We are converting a purse seiner into a pleasureboat. We are boating all summer. I would use the jars to hold battery candles and red candies or red white and blue candies for the 4th. They would als be nice for holding breadsticks. Really the options are just endless. I really enjoy all of your ideas. 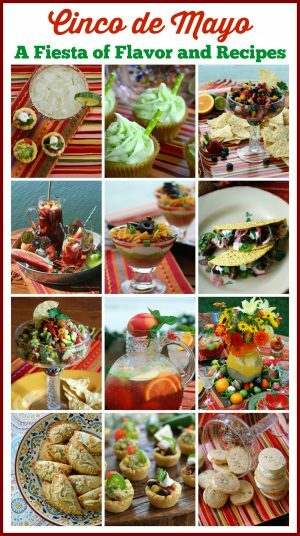 Loved the strawberry jalapeno salad dressing. Oh! It would be divine to have some of those beautiful Mason jars. I have a few of the old original ones that I use for flowers and in my kitchen window for the color to shine through. Thanks for the opportunity and just love your blog site with your wonderful talent of decorating with such beautiful displays. Love the blue, I don’t have any of those! I think I would have to use them for both flowers, at least one and my blueberry jam! Wouldn’t that look wonderful? I follow you by email! Thanks! I would go to the Pike Place Market in Seattle, buy enough flowers to fill each vase, then have my six girlfriends for lunch and give them their very own bunch of flowers. My idea of a great day, we would eat outside on the deck, enjoying the beautiful Puget Sound….love your site!! Oh those canning jars would be so useful for my niece’s wedding, which is in a barn!! I see them with fresh flowers and candles! I would love to win a set of these wonderful jars. I would use them to store my handmade tags in. Hey Mary! You know I would use the jars for orzo salad as well as other yummy items!! Probably some flowers from the farmers market as well. June 14th is my wedding anniversary so I am hoping this will be my lucky day!! Have a good day! Oh my. This is just what I’m looking for to use as centerpieces for my daughter’s upcoming bridal shower! I really enjoy canning fruits and vegetables. The Heritage Blue Ball jars would be used only to decorate, especially as vases. love that great ladder, and how you’ve displayed all the wonderful vintage goodies!! I love these jars. I enjoy canning and hope I have good yields from my garden and fruit trees. Love those jars. They would so be used for decorating!! I am a huge fan of canning jars too! They are wonderful for so much more than just canning! You certainly put them to beautiful use, Mary. Thanks so much for the giveaway! Count me in. I follow on your blog and facebook! I would use these pretty jars for flowers! I love flowers! They make me happy! So many beautiful things all in one place. I love what you’ve done with the ladder, the flowers and the watering cans as well as everything else! Just gorgeous! I don’t know exactly how I found your blog, but I am so grateful I did. Having just started decorating my own potting shed I am so inspired by all of your amazing decorations and collections. Not to mention the size of your shed. Mine is quite small but I am making the best of it. Love your photos and stories. How will you pick a winner for your jar giveaway? If I am lucky enough to win I will make good use of them in my new potting shed. Take care and I look forward to your next post! I love the blue Ball Jar and I have some that were my Grandmothers and I would love to win 1 of the 2 sets of 6 Ball Heritage Collection Mason that your are giving away. Love you site. what ? no more jars ? sooo many ideas …. I use to can years ago. Especially love the blue ones. I love all the new ways to use canning jars these days. All of your wonderful recipes filling these lovely jars, not to mention to using them for drinks when entertaining, storage containers for the shed, or just a pretty vase. I love seeing all your beautiful tablescapes. Thanks for all your shares. It must be fun to be on the waterfront and have a pontoon boat for cruising/entertaining. Love your out building. My husband just built one for me last summer. It has a lean to as well, so when it rains one can still relax under the eaves. I am still working on the decor for the inside. Its a great little tranquil space to have. I don’t have a lake, but have a pool and hot tub, so right now or enjoyment of water is through these. I keep telling my husband we should downsize when we retire and find a lakefront property, a small cottage home, but in the meanwhile I will enjoy your blog and keep dreaming. I loved the idea of the to go orzo salad in mason jars so I think I would use them for that. Later I would use them for drinking glasses because it would remind me of my Dad who brought them home many years ago for that purpose. Keep posting I really look forward to seeing your ideas and especially your Bichons! These jars remind me of canning with my grandma when I was young. She canned everything, but my favorite was peaches! I think I would put flowers in some and then, Epsom salt in the bottom with candles for our table on the deck! Thanks for the chance:). Your blog is lovely! Mary, I have always loved blue Mason jars. A vase for lilacs, think that would make a great color combination. For my old marble collection, those would show well in blue Mason jars. I could use in bathroom for make-up brushes or bath salts. In my bedroom for an artificial arrangement. in the kitchen for cannisters or knickknacks. Good Morning! LOVEly post, as always! 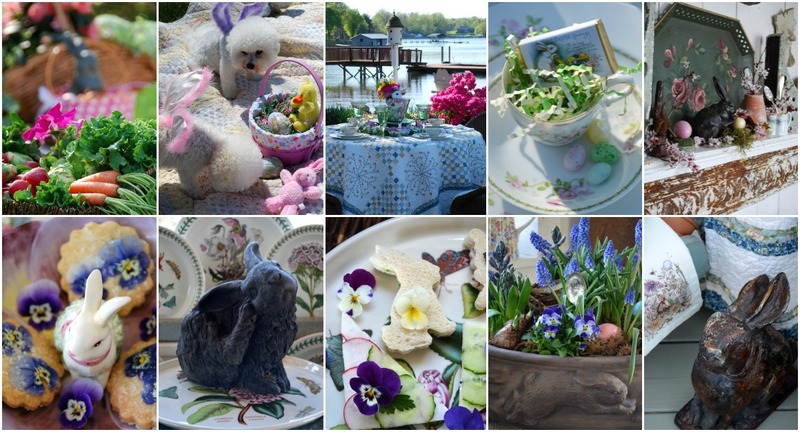 I so enjoy your tabletop arrangement talents and love of flowers…and of course, your owners – Chloe and Gracie. I can think of so many ways to use the mason jars, but filling them to overflowing with flowers would be their first use! Thanks for the opportunity. fairly often to see the grands…. So lovely where you are on the lake. Your blog is ALWAYS wonderful! A visual treat – for ideas in decorating, foods & flowers. I find much pleasure ‘playing in dirt’ in my perennial & vegetable beds & would use the mason jars as vases, & not for canning. Anniversary jars are too special just for canning! The lovely blue will match the skies here in Colorado. I will use them for my tablescape for the Assistance League’s annual “TableScapes” event. I think you have the most beautiful blog! I love it! I also love Vintage so the jars would be wonderful to have! I would use them for flowers or beverages! You have inspired not only me but my sister as well! Thankyou ! No one could make a canning jar look more beautiful, but I’d love a chance to use these for centerpieces on some of my vintage printed tablecloths. 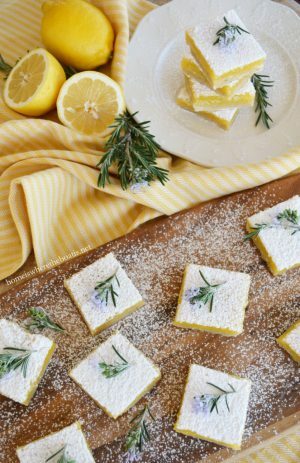 Hi Mary, I love opening your blog early in the morning to savor while I drink my first cup of tea :) I would fill the Mason jars with layered cookie or cake mixes, cut a pretty piece of fabric with pinking shears for the top and add a ribbon. They would then be given as housewarming gifts for new neighbors or I might save them for gifts for the neighbors at Christmas. Our subdivision is small and takes great pride in exchanging a small token of cheer such as a jar of honey from the neighbor’s hives, bottle of wine or homemade biscotti. We are so blessed to have wonderful neighbors. Love canning jars for decorating! I love the combination of the pink peonies in the blue jars. I would make similar arrangements for an Alice In Wonderland baby shower I am giving. Thank you for the many inspiring ideas & photos! So many ways to use the Ball jars. Decorating, as a vase for my beautiful zinnias, to hold utensils at a backyard gathering, for my delicious pickles and infused vodkas … the list goes on and on. Canning jars are so versatile! Great site. I’m so happy I had the opportunity to visit! Ball jars and summer. I have such fond memories of helping my Granny preserve her fruit from the Oregon farm. Thanks for your wonderful blog. I always look forward to finding it in my mailbox . I love these Blue Ball jars! I would like to use them for canning our favorite ollalieberry jam! My daughter loves to use our pint jars for drinking and I think the blue jars would be so beautiful! I also would mix them in my shelf with my light blue transfer ware! There are so many fun ideas to use these jars and blue is my favorite color!! I love your blog and I am already a subscriber! I always enjoy when you post a new blog!! Thank you!! I would love to use these jars! My husband and I have the opportunity to eat lunch each day since I work at his military base. I’d pack a robust salad in these jars everyday (he needs strength since he is a Marine)! For the extra jars, I’d be creative and use them around our home! I love your blog! Thanks for all the cute ideas! Your posts are so gorgeous! They brighten up my work day when I find one in my e-mail! I am a follower and am loving your ideas. I would use these jars definitely for vases, but also for decorations and other food storage, candle holders – so many things! Thank you for the inspiration always! I recently found your blog and am loving it… Until two years ago, we lived in Lake Wylie ,S. C. We now live in Myrtle Beach, and love it, but still miss the lake. love the blue jars, and would most likely use them as drinking glasses, as they would go great in my new sunny kitchen ! Thanks for the opportunity to win, and keep up the beautiful blog. Love the ball canning jars. They can be used for just about anything. I also follow your blog and by the way, the flowers are beautiful. I love peonies. Thanks! If I won the jars, I would use them for many things, flowers from my garden, candles, and also boat food. I loved your idea of putting simple meals in the jars and taking them out on the boat, we have a sailboat. Thanks for sharing all your ideas and pics with us! So fun seeing your ideas using the ladder. Would love a set of those jars. Love love love your blog. If I won these jars I would use them on my patio with little tea lite candles in them. I’m a collector of vintage and antique items and these jars would fit nicely. I live in Joplin Missouri and we need alittle light shinning here. Thanks for all of your cute ideas. Beautiful, as always! I absolutely love the blue mason jars. I would likely use them for flowers…and for pretty summer cocktails! Thanks for the giveaway opportunity! This southern girl is loving every part of your cowboy table scape and I can almost taste peach sangria in the mason jars. I follow your blog and so look forward to each new post. How can one person be so creative? Happy trails to you! I looooooove the mason jars and would use them for a summer party with lemonade or cocktails. Thanks for the giveaway! I love the blue color of the Mason jars. I’m thinking – sand in the bottom with and l.e.d. candle and perhaps a sea shell. Summer love. I’d love to use these fabulous jars as vases, as picnic ware, for storage, and for displaying so many different things. The possibilities are endless! Like others have mentioned…a candle would be lovely to add inside. I might just have to use some for serving drinks in, too! I would put either utensils or flowers in them. Also, maybe putting six of them in a older box and put silverware in it for a party! Love my canning jars not only for canning fruits and vegetables but also for floral arrangements, storing sewing supplies, food and dry goods but especially for taking hot soup to dear friends suffering from colds or other ailments. Would add flowers from my garden to them and also sand and vortices for my front sidewalk. I am a new follower on Facebook. Love your blog. Oh.my.GOSH!! Loving everything your post! The colors are so amazing and beautiful…who doesn’t love flowers, watering cans, and canning jars! Your posts make me feel like I’m sitting right there enjoying everything you put together! Would love to have the jars, brings back wonderful memories of canning with my Grandma & Mom! Canning! All things homegrown! That’s what I would use these beautiful blue Ball jars for, to keep or to giveaway. Of course, they make great down home style vases, drink glasses, candle holders, etc! I would love, love, love to win these. Thanks for the chance! BTW, I am a new follower on Bloglovin’! Mary, your blog is beautiful!!!!!!!!!!! I visit you several times a week. I’m a canner — tomatoes, juice, jams, salsa, peaches and pears — all from my garden. I also collect blue canning jars, scooping them up at antique stores and flea markets. I even have a lilac colored jar. As you have shown they look lovely filled with flowers. I love Ball jars, they make the best storage containers for pasta and beans. I have so really old ones with the zinc lids. It is kinda kismit that I should be entering your giveaway for the new blue ball jars. I just found you through an entry you made in French Country Cottage called “Ball Jar Love”. I was taking a quick glance and when I came to the bottom there was this beautiful blue jar that had the prettiest white and red flowers. I clicked on that one and found you. Did not take me long to realize I WANTED TO BE ON YOUR EMAIL LIST. I love those jars and have been eyeing them for some time now. I would love to use them to bake in or serve a yummy dessert. I know i would have to put flowers in one and probably a collection of my white stones. They would look so pretty beside my mercury glass, especially in the winter with white candles floating in them. I might put my small collection of vintage keys in one. A bit of moss and some white eggs beside the duck egg blues one would be real pretty. All I know is that I would have to have one in every room. Sooo glad I found you. Thank you so much! Thank you for the opportunity to win a set of these beautiful Ball Masons. I would use them for flowers, drinks, food and desserts! Love your blog! Very inspiring! Sorry I am not very original but I would use it for flowers, canning I am not up to doing!!! Would need some lessons! I would use the jars for a nest with eggs (decoupaged with old French paper), nest with bird and eggs, stick candy and chocolate lady bugs. Flowers of course!